There are numerous types of cardamom—green, black and even white cardamom. 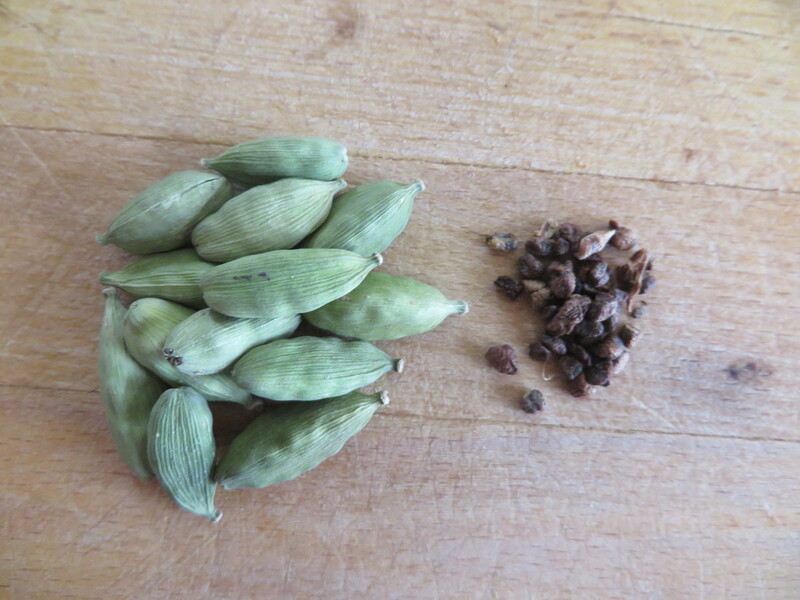 Each has its own taste and culinary usage, but green cardamom is the one we will focus on. Grown mainly in India (80% of the world’s crop comes from here), cardamom grows on a bush and is related to the ginger family. Green seed pods form at the base of the bush, which must be hand-harvested before the seed pods split and fall to the ground. Upon opening the green pod, tiny black, aromatic seeds are found, and this is what is used in cooking. Cardamom is a very warming spice. It has the comforting flavor of cinnamon and ginger mixed together (in my opinion). Ever drink a chai or chai latte? That spice mixture that gives chai its distinct flavor is made with cardamom, cloves and cinnamon, among other spices. Indian desserts such as kulfi (a type of Indian ice cream) or kheer (rice pudding) are usually perfumed with cardamom. In the Middle East, cardamom is used to flavor coffee. Most notably, cardamom is a central spice to Danish and Swedish baked goods (pastries, Christmas cookies and breads). The seeds are usually ground into a powder and added to recipes. A pinch of ground cardamom is great in yogurt, applesauce, pear sauce, mango purée and mashed bananas (a combination I remember fondly as a small child). The aroma and flavor are so gentle and tasty, it has to be one of mine and my child’s favorite. A cup of warm milk with a sprinkling of cardamom is also lovely, and a nice easy way to introduce your child to this wonderful spice. I am in fact thankful to the holder of this website who hhas shared this fantastic article at at ths place.